The LED manufacturer rates the life of each individual LED at 50,000 hours if driven to full brightness. Each playfield inserts is backlit by a cluster of three LEDs which are driven only to one-third the manufacturerï¿½s specified maximum brightness. Should any of the three LEDs in a single insert cluster ever fail, the system hardware will automatically increase the brightness of the remaining LEDs to compensate for the failed LED. This redundancy, coupled with the long life of the LEDs, means most owners of the Medieval Madness remake will never replace a single lamp over the games lifetime. 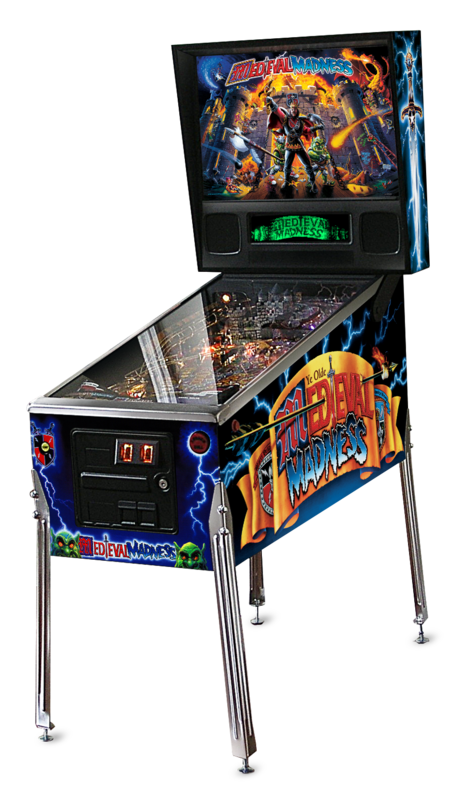 Whether you are a pinball novice or expert, you'll come to appreciate the gameï¿½s universally appealing gameplay, which includes the exploding castle, motorized drawbridge and two pop-up trolls. Your mission in this multi-ball game is to battle for the kingdom! Step back in time to the middle ages of the 15th century where kingdoms were fought and lost for.